Hotel Traiano, Rome. 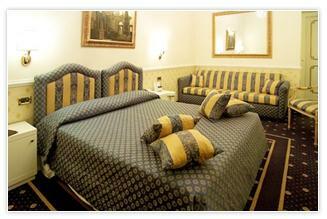 Traiano Hotel Rome. A splendid structure in the heart of the Ancient Rome, at a few steps from the most famous and important monuments of the city, like: Fontana di Trevi, Colosseo, Piazza di Spagna, Piazza Veneto and the splendid Via Veneto. The Hotel Traiano is ready to welcome you in the centre of the Eternal City, with its high-class and accurate services, elegant ambiences and rooms provided with every modern comfort for an unforgettable stay. In the morning you will be welcome in our splendid breakfast room, characterized by an authentic style of the 19th century, where you can taste the most refined products and so start your day with the right energy. Perfect for business men that need quick movements, as well as for tourists that in a few steps can reach the main attractions of the city, at a few meters from the hotel you can also find a parking (you need to check the price with the hotel). It is not all: the hotel lies not far from the Termini Railway Station, from where you can easily and quickly reach other nearby cities. Our reception is at your disposal, in order to organize your stay in the best way and book for you visits or guided tours, restaurant or spectacle. This 4-star hotel is composed of 4 floors, all reachable with lift and has also a bar. Finally, we remind you that your small pet are welcome, but you need to pay an extra price that must be checked with the hotel.